Governments and citizens both benefit when services are delivered online. But the adoption of online government services is often constrained by challenges with user registration and authentication. The usual problems of password security, forgotten passwords and sign-up abandonment are heightened for government services - they need to know its you to deliver the service. High credential churn drives up operational costs, weakens security posture, and frustrates users who want to accomplish tasks online. To combat password problems, many commercial sites are now introducing “Bring Your Own Credential” solutions. But can BYOC work for government services. Join us as we discuss practical ways that government services can implement BYOC solutions to improve the customer experience while enhancing site security, business assurance and citizen privacy. In what might be the most dramatic lapse of Internet security in history, the Heartbleed bug has shaken every corner of the web. Heartbleed threatens a web services in a wide variety of industries across the globe - 2/3 of the websites on the Internet used the compromised the OpenSSL technology. - Introduction of the concept of Digital ID and the role of Dynamic Authentication has to play to make customer access easier and to increase security. - Insight into the lessons learned and recommendations on how to anchor customer Digital IDs in trusted devices with dynamic authentication. - What is digital/virtual currency? - What is the value proposition and what problems does virtual currency solve? - Critical Trends in the virtual currency market? - Is virtual currency all about mobile payments? - What are the characteristics of a solid digital payment solution? - What do stakeholders need to do to be ready? Our digital identities are critical elements to our lives. Yet, most users today are managing more and more identities, with no end in sight. •The inevitable choice: Should you rely on a trusted reusable Identity your customer already has? Or become a trusted identity provider to strengthen and monetize your customer relationship? 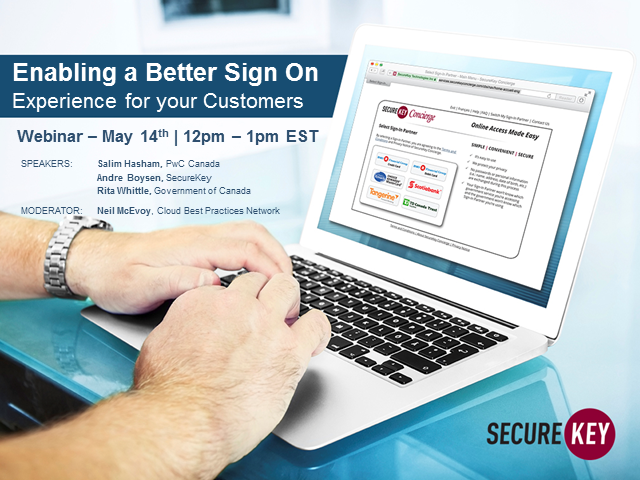 All webinar attendees will receive a complimentary copy of the Thought Leadership Paper, Increase Security and User Trust, Embrace a Federated Consumer Identity Model a commissioned study conducted by Forrester Consulting on behalf of SecureKey Technologies. Mobile devices have become central to our daily lives. Whether it’s for work, pleasure or completing errands, mobile devices can do it all. Applications transform mobile devices into multi-purpose tools. However, the challenge for mobile app developers lies in engaging and gaining adoption of your app. - Did you know that 1 in 4 apps is abandoned? - Did you know that 60% of mobile apps are never downloaded? How do you overcome these issues? Join us on this webinar to explore the findings of our whitepaper and learn about the 5 must have top tips to design and implement successful and secure mobile apps. One of today's biggest challenges for Internet users today is the sheer number of IDs and passwords we need to manage our online life. With every single destination, users have dedicated user ID and password -- and we've kind of reached the point that that's not scalable any more. One alternative solution is to use credential federation, providing the user a smaller set of credentials to reach all of their online destinations. This Webtorials Thought Leadership Discussion addresses this growing challenge -- with insights provided by Internet security expert Jim Cavanagh; along with Andre Boysen, Executive Vice President of Marketing at SecureKey; and Thom Hounsell, SecureKey's Director of Product Marketing. The briidge.net Exchange Platform is used to build trusted identity networks by connecting users’ identity providers with their online services though a cloud-based broker service, designed specifically for large scale consumer and citizen communities. The platform significantly lowers credential management costs for online service providers, while removing user sign-up barriers, preserving user privacy and providing greater user convenience. SecureKey Concierge, is an innovative Credential Broker Service that allows Canadians to use their bank authentication credentials to access online services from the Government of Canada. Four of Canada’s largest banks are the initial Trusted Sign-In Partners, with other financial institutions expected to follow in the coming months.